Harry and Christophe have a week left to go on the record breaking run of The Bristol Old Vic’s smash hit A Christmas Carol. Tickets are available until Sunday 13th January here. 22/10/2018 Rehearsal’s have begun for A Christmas Carol! The Wellies’ own Harry Bird and Christophe Capewell will be performing in the Bristol Old Vic‘s new production of Charles Dickens’ timeless tale as onstage musicians, the philanthropists Bourne and Ridley and the two twin girls Suzy and Sib! Tickets are available from November 29th – January 13th 2019. Tom Morris (The Grinning Man, Swallows & Amazons) joins forces with director Lee Lyford and composer and lyricist Gwyneth Herbert (The Snow Queen) to present another festive feast for all the family – not to be missed! 01/10/2018 HAPPY 10 YEAR ANNIVERSARY WELLIES!!!!!!! 30th June-1st July Iona Village Hall Music Festival Iona SCOTLAND SOLD OUT! Happy new year everybody! The Rubber Wellies kick off 2017 with a 19 day tour of Italy which promises to be a great winter pick-me-up. The tour takes in Varese (02/02), Livorno (03/02), Santa Margherita Ligure (04/02), Milano (05/02), Mantova (06/02), Napoli (08/02), Vallo della Lucania (09/02), Roma (10/02), Arceto (11/02), Brescia (12/02), Perugia (14/02), Valmontone (16/02), Sora (17/02), Borgo a Mozzano (18/02) and Sermide (19/02). 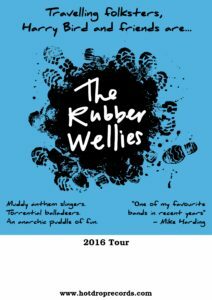 See the Wellies’ tour listings for full details. Also, as a new year’s gift we thought we would remind ourselves of warmer days to come with this video of Christophe and Harry performing “Who’s Gonna Lead the March Upon the Jailhouse…?” back in summer 2016. 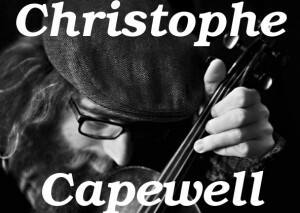 Watch very carefully for Christophe’s incredible bowing trickery! The Rubber Wellies’ last gig of the year was at the fantastic Brasserie de l’ANNWN in Switzerland. With a schmattering of snow up in the mountains and plenty of candles on pine trees glowing away the trip was pretty darn Christmassy! It was just what the doctor ordered after a year that has laid on an unusual amount of challenges to go with the highs, as many of you will know. So this is a great big thanks to everyone for all your support in 2016 – we keep doing what we do because of you. Merçi et Joyeux Nöel, folks! 31/10/2016 Txintxo por Tatu’s 2nd album release! 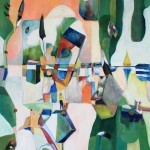 Txintxo por Tatu‘s second album, composed and recorded back in 2012 over ten summery days in The Rath, Co. Meath, Ireland, by Harry Bird, Christophe Capewell and Patrick Durkan has been made available for the first time. Mick Durkan’s front room was where the musical accompaniment was cooked up to the mad-cap constructions of the basque inventor-acrobat Gorka Pereira and his show “Vademecum” (The Tome). Download it here and pay what you like! El segundo trabajo de Txintxo por Tatu ya esta disponible! 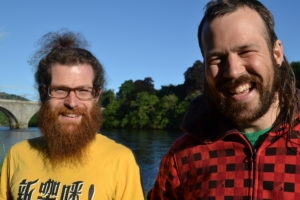 Grabada en el verano del 2012 en una granja de The Rath, Co. Meath, Irlanda por Harry Bird, Christophe Capewell y Patrick Durkan, forma la banda sonora de “Vademécum”, el espectaculo de la compañia circense bizkaina De Bote en Bote. Descargalo aquí y paga lo que quieras! In just under 2 weeks The Wellies will stride out among the autumn leaves for their last tour of the year. Harry & Christophe will be joined by Kate, Jamie, Dodge, Will, Hedge and Adam as they wend their way across England! DATES: Lincoln (01/10), London (02/10), Brighton (05/10), Lewes (06/10), Deal (07/10), Kettering (08/10), Hope (09/10), Barnsley (10/10), No Place (13/10), Lanehead (14/10). Harry Bird, Christophe Capewell, Kate Theodore, Adam Downey, Ian “Dodge” Paterson, Marcella O’Sullivan, Laura Mu, Sweeney Lee, Ruth Gordon, Barry Nisbet, Theo Barnard, Donny McElligott and Jamie Bird. Don’t forget to bring the appropriate footwear, ha ha! ENGLAND: (21/04) Sheffield, (22/04) Durham, (23/04) Bristol, (24/04) Worth Matravers, (25/04) Brighton, (26/04) Winchester, (27/04) London (Camden), (28/04) Swanwick, (29/04) Burton, (30/04) Moulton, (08/07) London (Upper Clapton), (09/07) Cambridge and (11/07) Norwich. IRELAND: (09/06) Cavan, (10/06) Kilkee, (11/06) Bantry, (12/06) Clonakilty, (15/06) Cork, (17/06) Ballydehob, (18&19/06) Dublin and (22/06) Clifden. SCOTLAND: (25/06) Dunkeld, (26/06) Glenisla, (29/06) Aviemore, (30/06) Iona Festival, (01/07) Tobermory, (02/07) Kelburn Garden Party and (05/07) Glasgow. Should be a whole heap o’ craic! Here’s a video from Harry Bird and the Rubber Wellies (as they were still known then) on Iona for the festival in 2014 – enjoy! 24/02/2016 Txintxo por Tatu album release! “Echadas a la Mar” – Out now! The atmospheric recording from the midnight session in 2009 is finally available to all and sundry. Download Txintxo por Tatu’s first album here and pay whatever you want (yes, even NOTHING)! “Echadas a la Mar” – !Disponible ahora! Por fin aquella grabación nocturna del año 2009 tan llena de personalidad está disponible para todxs. Descarga el primer disco de Txintxo por Tatu aquí y paga lo que quiras (si, incluso NADA)! 16/02/2016 “Bricks and Feathers” in the Top 10 of 2015!!! Described as “un disco variado, fresco y divertido como pocos” (an album that is fresh and diverse like few others) by Spain’s popular Mondo Sonoro music magazine, it was voted #3 in the Top 10 Spanish folk and americana albums of 2015! ¡Goooooooooooooooooooooool! 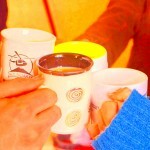 Aaaah, fill up yer mug with a wee hot drop and see what we have in store for ye. Well as far as The Rubber Wellies are concerned, not alot for the first few months, funnily enough! But that’s just the way they like it at the moment – they’re trying to take it easy this winter. Touring only begins in England in April, followed by Ireland and Scotland in June/July, before festival season kicks off in August. Trying to take it handy – that’s the idea anyway! But there’ll still be gigs a plenty, all told, so keep an eye out to see if they are playing near you when the spring and summer come round. Meanwhile Harry and Christophe will be busy with plenty of other proyects: writing, recording and sorting out the Hot Drop back catalogue for one. 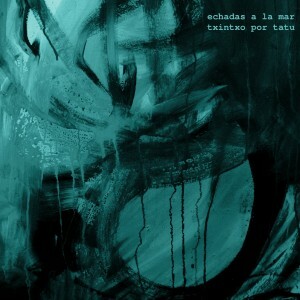 For this reason we are pleased to announce the release in February of Txintxo por Tatu‘s 2009 album “Echadas a la Mar”. 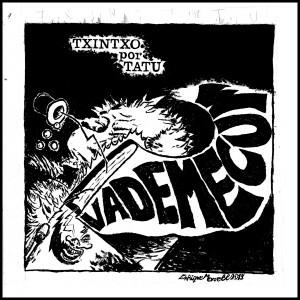 It will be followed by their 2012 album “Vademécum”. More to come on that so watch this space! 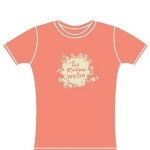 21/12/2015 The Rubber Wellies – new name, new tees! To celebrate the name change The Rubber Wellies have made some new T-shirts! The cotton T-shirts designed by Kate Theodore are available in a range of colours and sizes: S/M/L (forest green, russet and daisy yellow) for the men and S/M/L (heather orange, light blue and chestnut) for the ladies. And as they’ve already got muddy boot prints all over them, you don’t have to worry about getting them dirty! 15/12/2015 Bird becomes Welly! HBATRW name change! Dear Hotdroppers. 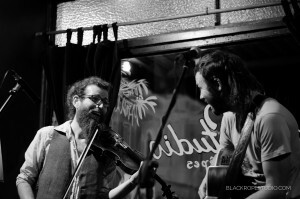 After 8 years, 3 albums and over 500 gigs, Harry Bird and the Rubber Wellies will play their last ever concert together at the Hogmanay 2015 Folk of the Wood Ceilidh in London… But not to worry folks, they are not going away. As of 1st January 2016 they are simply shortening their name to The Rubber Wellies. Thus Harry will at last fulfil his ambition to join Christophe and company and become an official member of the gumboot crew. Vivan los Katiuskas! 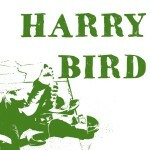 18/11/2015 ¡Presentación del nuevo disco de Harry Bird y los Rubber Wellies en diciembre! Fecha: viernes, 4 diciembre a las 21h / azaroan 4 ostegunan, 21etan. Precio: 3€ la entrada. 7€ el disco – promoción unica! ¡Venid a disfrutar de una gran noche de canciones, bailes y…. el juego de las sillas! Tocarán los “Katiuskas” Harry y Kate con unos invitados de lujo: “Chokin’ Wolf” Jokin a la guitarra, “Andrew Ash” Entzi al bajo y “Huge Stephen” Hugo a la percusión. Way aye man! Here’s a live performance of “There’s a River”, masterfully shot by Simon O’Neill in Bewley’s Theatre, Dublin. Woo hoo! Here’s a wonderful new video produced by the multimedia artist Kate Theodore for “The Golden Vanity”, B side of the “Kettle of Silver” vinyl single.